Take Four, the final book in the Above the Line Series by New York Times best selling author Karen Kingsbury, two dedicated Hollywood producers Keith Ellison and Dayne Matthews as they seek to transform the culture through the power of film. Take Four sees the pair finally ink a deal to have the nation's top young actor star in their current film. But when the actor takes a public fall that threatens his reputation among his fan base, the producers must act as missionaries to save the film, their families, and the young movie star. Karen Kingsbury's book captures hope, heartbreak and even a search for happy endings. Breakthroughs take place that the public will never know about, as the possibility of saving the world through film is finally a very real possibility. Take Four by Karen Kingsbury was published by Zondervan in June 2010 and is our 13795th best seller. The ISBN for Take Four is 9780310266273. Be the first to review Take Four! Got a question? No problem! Just click here to ask us about Take Four. What is the book "Take Four" by Karen Kingsbury about?? 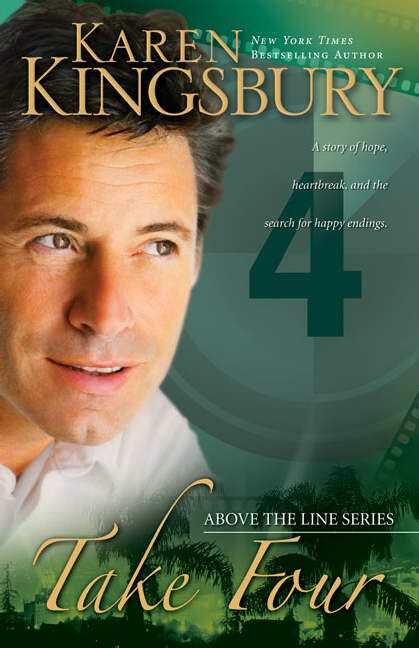 A:The book, "Take Four", by Karen Kingsbury follows 3 previous books in the above the line series (Take 1, 2 and 3) and is therefore probably best read after the other three. This final book is based around an actor starring in a film who takes a public fall which threatens his reputation among fans. The producers of the film must then act as missionaries to save the film and the movie star. It incorporates themes of hope, heartbreaks and a search for a happy ending.